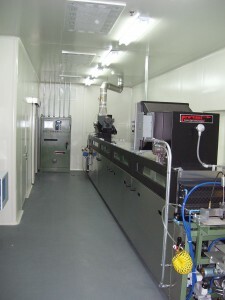 HED International has designed complete turnkey systems for tape casting co-fired ceramics including LTCC. These facilities have been implemented successfully by companies with operations in the US and Asia. The bottom line result is faster start up, increased precision, reliability, operating simplicity, low implementation cost and high return on investment. The total is a “soup to nuts” package. The key component is the tape casting machine which can range in size from the bench scale Model TC-71LC Tape Caster to much larger scale production machines depending on the out put required. Individual components are available including formulations, mixing, milling and conditioning equipment and quality control tools. Technical guidance is included in the turnkey package and always available on a per diem basis.